The ANDROS MARK V-A1 is the largest, strongest, robot in the REMOTEC family. 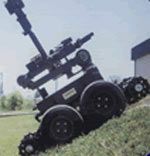 Its 3.5-mph speed, coupled with its unique articulated tracks allows the ANDROS MARK V-A1 to rapidly maneuver over rough terrain and obstacles, climb stairs, and cross ditches as wide as 24 inches. The vehicle is environmentally sealed to operate in any weather condition and in areas of high temperature/humidity.